North Carolina's Hobex, led by guitarist and singer/songwriter Greg Humphreys, infuses rock n' roll with the funky soul grooves of Memphis, New Orleans, and Motown. Think The Beatles meet Marvin Gaye and Curtis Mayfield. Hobex earned a reputation as a sparkplug of the southern soul revival by performing over 1000 shows across the U.S. Canada, and Europe. The band has been a staple on the music festival circuit. They've shared the stage often with contemporary roots-miners like North Mississippi Allstars and JJ Grey and MOFRO, as well as legends Parliament-Funkadelic, Al Kooper, Bernie Worrell, George Porter Jr., and Fred Wesley. Hobex has appeared on World Cafe, Mountain Stage, and Sirius Satellite Radio, scored a top ten hit on North Carolina top 40 station G105, and their music appeared in the hit film Rounders. Enlightened Soul is the 6th CD release for HOBEX, with previous releases on labels Slash/London, Tone-cool, and Phrex Records. Alternative rock and Power-pop fans also know Bandleader Greg Humphreys as the voice of Mammoth/Atlantic recording artists Dillon Fence, a seminal band for the early '90s Chapel Hill NC music scene that spawned Ben Folds and Squirrel Nut Zippers. Humphreys' songs have been covered by Hootie and the Blowfish and Letters to Cleo. CREATIVE LOAFING Preview By Kandia Crazy Horse In Hobex' recordings, Humphreys is like an alien time lord (á la Doctor Who) who embodies tomorrow's altered states today, while also reaching backward into back-porch nostalgia and reflection. This strange impression is cemented by the unbearably beautiful "So Far Away" from U Ready, Man? With its stacked descending guitar figures, soul-cleansing falsetto cries, filtered sunlight and sense of escape to the hidden America, the song is simultaneously alt-psychedelia, space rock and country gospel. ROLLING STONE Review by Adrian Zupp Here's a triple threat for ya: spicy soul-funk-jazz that'll put taste buds on your eardrums. What they've laid down here is an hour of untainted music-from-the-heart that owes as much to improvisation and intuition as it does to technique and calculation, which is to say it has soul, baby. 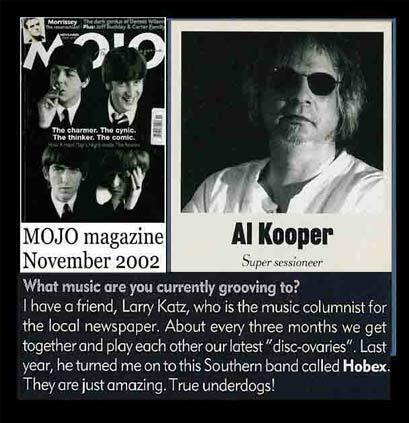 MOJO MAGAZINE by Producer / Musician Al Kooper I have a friend, Larry Katz, who is the music columnist for the local newspaper. About every three months we get together and play each other our latest "disc-ovaries." Last year, he turned me onto this Southern band called HOBEX. They are just amazing. True underdogs! NEW YORK TIMES ALBUM OF THE WEEK by ANN POWERS Andy Ware on bass and Steve Hill on drums match the casual chops of Mr. Humphreys, sliding through songs that honor Al Green and Alex Chilton. Horns and backup singers thicken the gravy. Mr. Humphreys can fly solo, too, as he proves on ''It Pains Me,'' a blues that surely has them slow dancing in dives from here to Gainesville, and perhaps in New York, too. NEW YORK TIMES Preview by ANN POWERS HOBEX is a soulful party band led by Greg Humphreys, who is turning into the Van Morrison of the college-rock circuit singing his own poignant compositions alongside chestnuts by the likes of Sam Cooke... the grooves will flow. JAMBASE.COM Summer Tour Preview by Ted Kartzman Here's a tip: Go See Live Hobex this summer! Hobex is passing on history of Southern soul, and it's an important musical lesson to learn... U Ready, Man?, blew me away when I heard it, and on a few levels. Now it wasn't the jammiest record ever, but every song struck a chord with me. Seriously, just about every song was so catchy; you found yourself singing along, bobbing your head, or tapping your feet. JAMBASE.COM Review by Ted Kartzman HOBEX is everything I like about the sweet soul music of Marvin Gaye, Stevie Wonder, Al Green and Curtis Mayfield. Vocalist Greg Humphreys takes the best of Gospel R&B, puts a tight funk band behind it, and created modern soul music. LA WEEKLY Review by Michael Lipton "HOBEX Back in the '90s (WEA/Sire)" Writing and arranging songs like he1s the godchild of Al Green and Alex Chilton, singer-songwriter/guitarist Greg Humphreys has happened on a sound that, from the first note, crackles with freshness and inspiration... Most musicians quickly figure out how to borrow from the masters, but only a few are talented enough to listen and learn a thing or two. INDEPENDENT WEEKLY by Gavin Ohara "I think Greg is a real soul singer," says Jimbo Mathus, founder of the Squirrel Nut Zippers and Humphreys' bandmate in the Jas. Mathus Knock Down Society. The two met during a tubing trip on the Yadkin River several years ago, and spent a couple evenings playing old gospel and bluegrass songs together. "He's a great white soul singer, and I say that because it's mostly a black man's field. It's a sympathetic, intuitive thing. Greg doesn't have to try to be a soul singer, he just is. He has a great gift, and a style that's unique--poppy but real soulful. His songs have that timeless feel to them." MEMPHIS FLYER Review by Mark Jordan North Carolina's HOBEX commute between Hitsville and Soulsville... you stick in the CD, and that turns out to be all it takes. The funky soul/pop begins to wash over you and, like the best gospel music from which it is partially derived, begins to buoy your spirits upward, dragging your body not far behind. JAMBANDS.COM Interview by Jeff Waful The North Carolina-based group has a timeless sound, which serves as the perfect contrast to those marathon instrumental jams that typically inhabit the improvisational world. Although HOBEX is comprised of stellar musicians, the band understands the concept of dynamics, both in its songwriting and its song selection. While the live show typically features a rotating cast of additional players and extended improvisation, the group's most recent album, "U Ready, Man?" boasts catchy, concise arrangements inspired by the likes of Al Green, Marvin Gaye, Prince and Stevie Wonder. RELIX MAGAZINE Review by Jeffrey Greenblatt You can see why HOBEX has been grabbing people's attention... A regional phenomenon in the Southeast since the mid 90s, HOBEX updates the Stax and Motown soul of the 1970's by combining it with jazz, blues and good ol' rock n roll. AN HONEST TUNE MAGAZINE Review by Tom Speed, Editor HOBEX Has Soul. They have continuously drawn comparisons to the soul masters of the 70s' folks like Al Green and Curtis Mayfield. And their sound does indeed hearken back to those days. What's more, HOBEX has infused the genre with the type of vital energy that can invigorate a style, breathe new life into it and drag it out of the graveyard. But this is no nostalgia act. There is a youthful energy here that is impossible to deny.